Microsoft is the latest company to come out with an ad that supports the LGBT community. The advert is promoting the latest features to stay connected on their Outlook.com campaign and includes a scene with a lesbian wedding and kiss. They’re not the only company running national ad campaigns that include LGBT couples. Kindle has a commercial with a married gay couple. Volkswagen had LGBT billboards. Ellen DeGeneres is the face of CoverGirl cosmetics. Absolut Vodka is the official sponsor of Rupaul’s Drag Race. 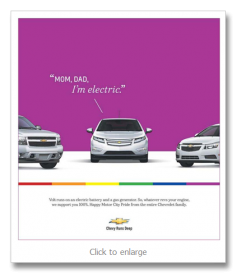 A GM Chevrolet Volt ad ran in a small, Michigan based LGBT publication, aimed at sparking interest among LGBT consumers who, based on a marketing survey, like more expensive, fuel efficient cars. The ad showed the new Volt “coming out” to two older generation cars with the phrase, “Mom, Dad. I’m electric” and a rainbow banner along the bottom. The company didn’t expect the ad to go viral, garnering over 11 million views on various social media channels. Posted March 18th, 2013 & filed under Money. Is your new job offer a good fit?